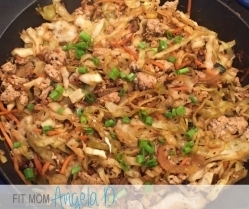 One skillet meals are my favorite and this one is being added to ‘the list’ at our house. 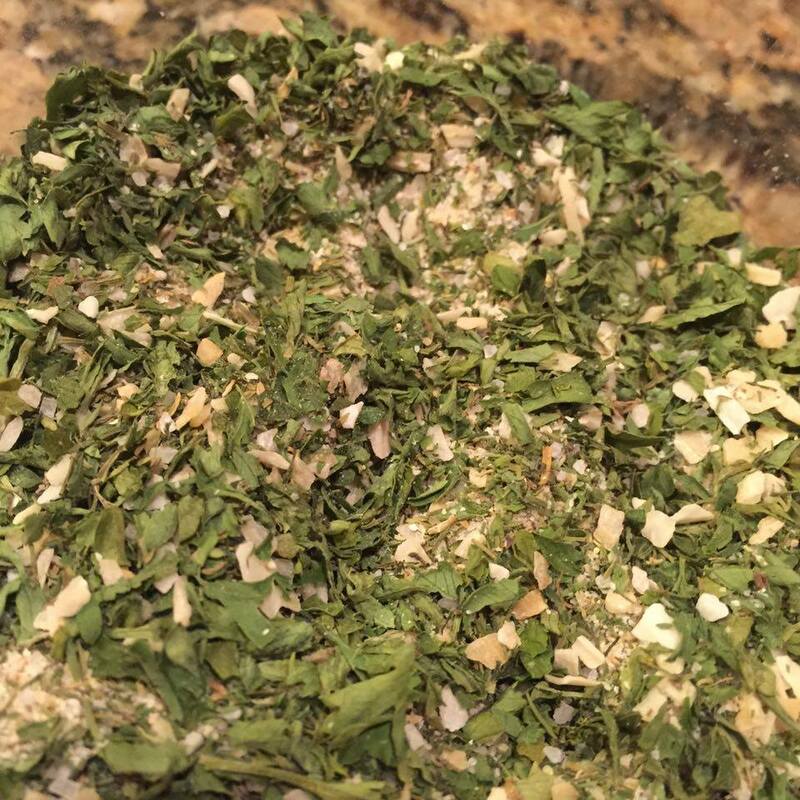 🙂 It is something a little different, the spices/seasonings are different than my normal go-to, but we liked it a lot! 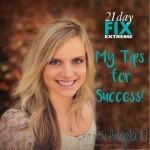 It was EASY to make, clean and 21 Day Fix Approved, of course! 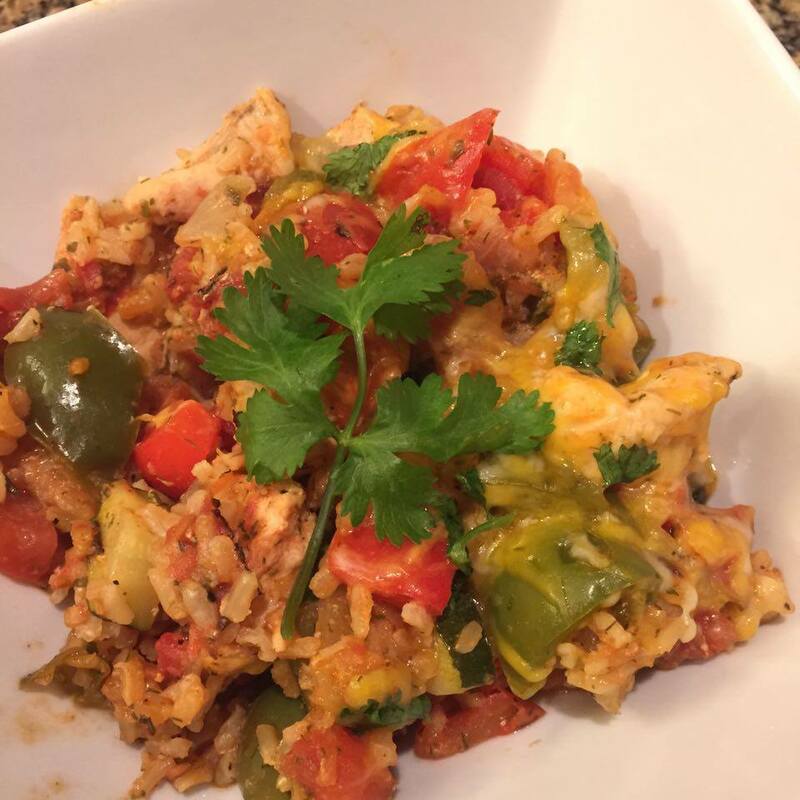 My Healthy Ranch Skillet did not disappoint in regard to time, taste and clean up! 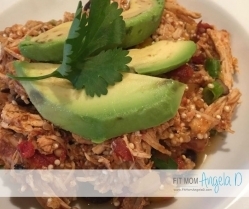 A flavorful, healthy and simple meal! 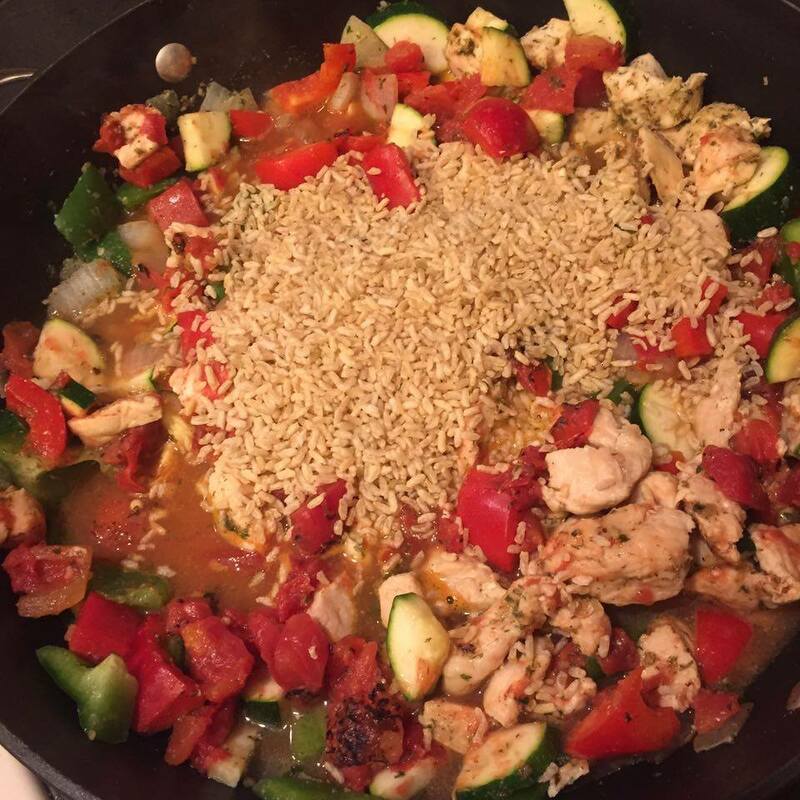 The flavor was different than my usual blend of spices and we really enjoyed it! 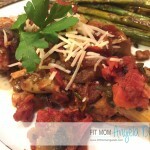 I really love skillet meals and this one will be happening again! In a 12" skillet, heat oil on medium high. 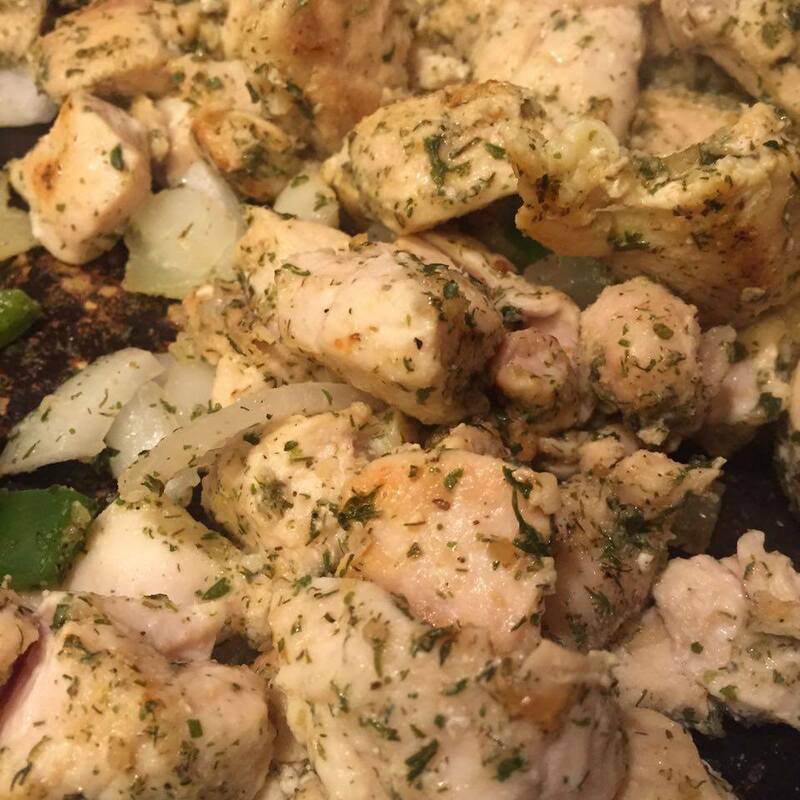 Add chicken, onions and ranch seasoning blend. Saute and stir often for 2 minutes. 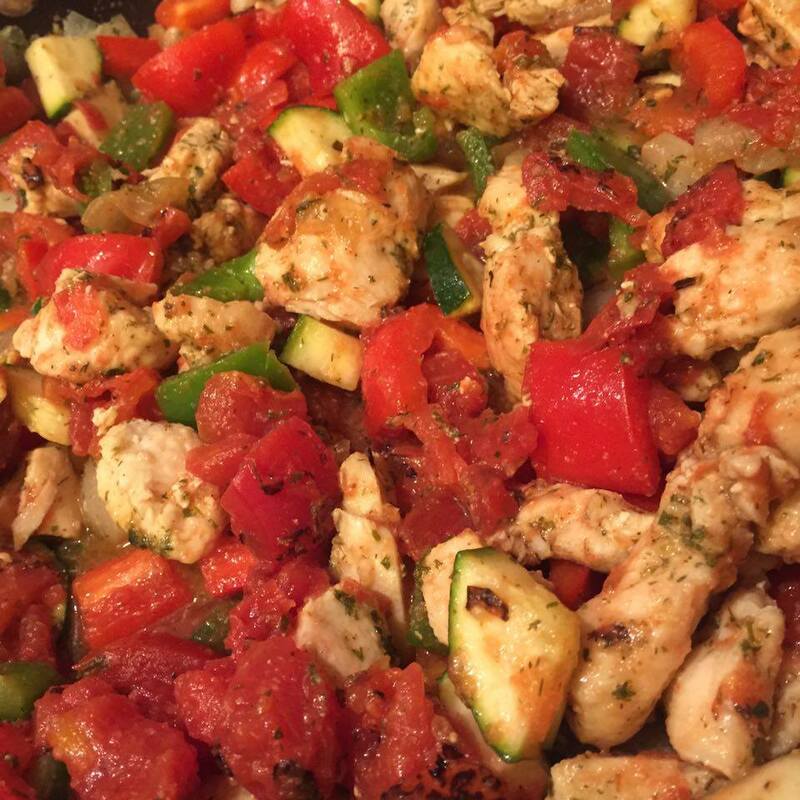 Stir in bell peppers, zucchini, beans, tomatoes, rice and chicken broth. Bring to a boil, then cover. 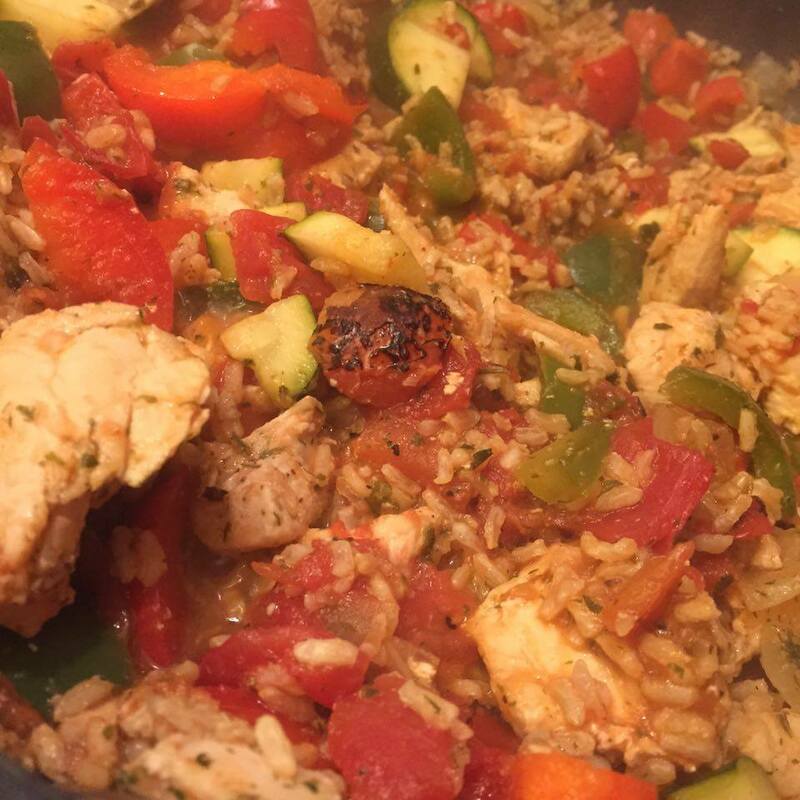 Simmer on low for 5 minutes or until chicken is no longer pink in the center and rice is tender. Sprinkle cheese evenly over skillet, cover and let stand for 5 minutes, until liquid is absorbed. 1 serving= 1/4 of the skillet! 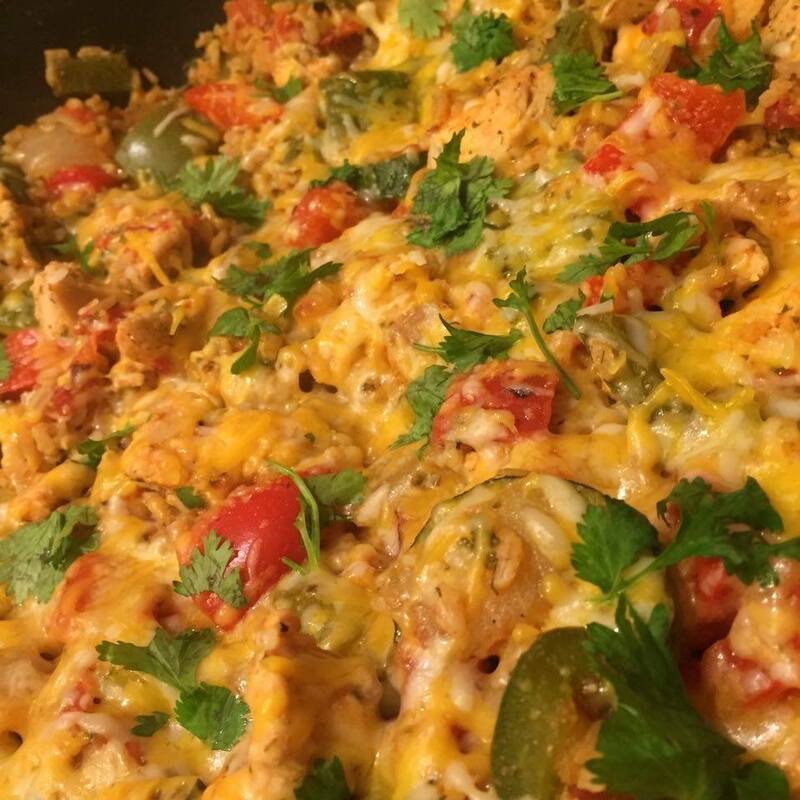 Love the chicken ranch skillet! YAHOO!!! So happy you love it, Gail! 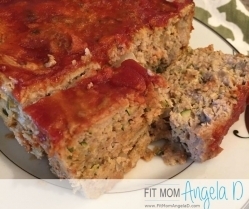 This recipe is ah-mazing! It served 2 meals for my husband and me and was better warmwd up the second day. We added some hot sauce on top for a little Mexican flare. 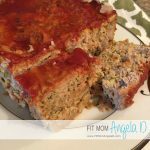 Thank you for posting a ton of great recipes! Wow! That’s delicious! Made it tonight and my family loved it! Thanks for sharing! 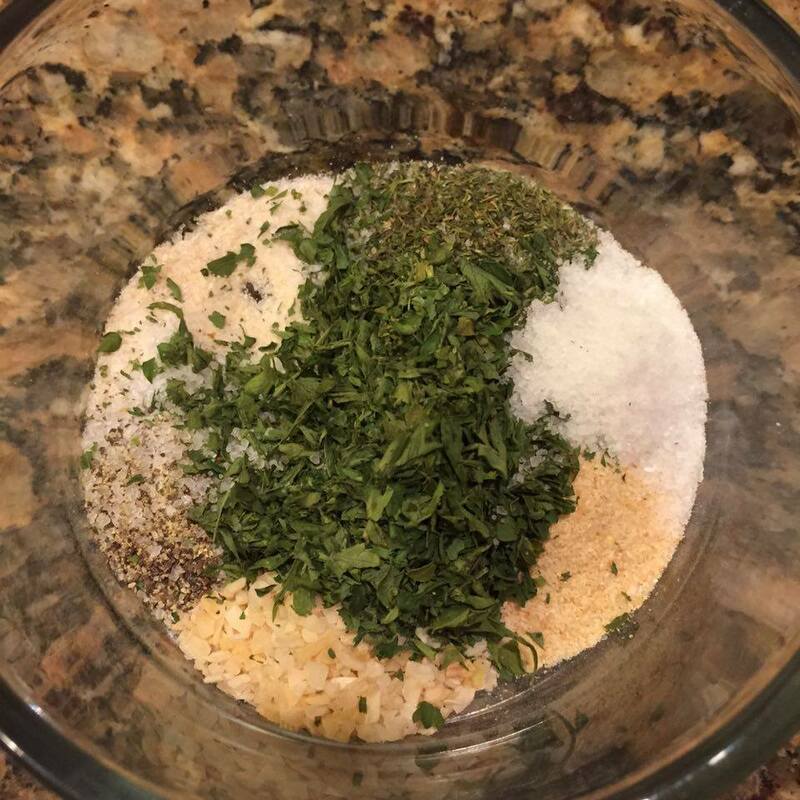 Your “ranch” mix is so yummy, I can’t wait to put it on other things. Do you happen to know/have a measurement for 1/4 of the skillet? I’m going to double this to have leftovers, and feeding the rest of family so it will be tough to guess at the portion of the skillet I end up having left over. Is there any way to know the calorie count on a serving? Hi Sara! If you wanted to sub in rice for the beans, you could do that without affecting the counts. If you remove the beans, just take out the yellow! 🙂 Enjoy! This was seriously so good! I made some extra chicken with the seasoning and it’s fabulous as well. Thanks for sharing! Do we use the whole thing of seasoning? Or does that leave some leftover? I have some Hidden Valley Ranch seasoning & salad dressing mix that I wanted to use instead. What would the measurement be in that? 2 1/2 T ? Hi Cindy – Yes, I believe it is about 2 1/2 T.
How did it turn out with 2 1/2 T of the hidden valley seasoning? I’m wanting to do the same! 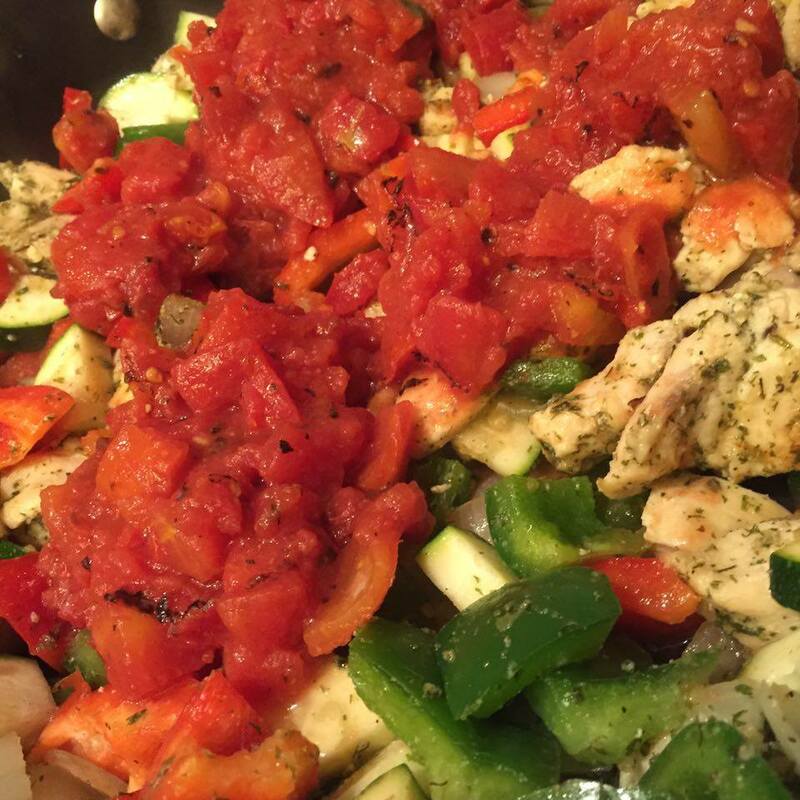 What 21 Day Fix Containers does this use? This was fantastic! Looking forward to having it again tomorrow. Thanks for another great recipe! 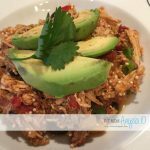 Is there a way to find the nutrition facts per serving in this recipe? And how much exactly is a serving size? Is there a substitute for the sun dried tomatoes? I couldn’t find the ones that you were talking about in the produce section. I was only able to find the kind in the jars with oil. This was so good!! My husband is a tough critic and he said this was a keeper. Thank you and I look forward to trying out your other recipes! Wow! This was so good! I love skillet meals and have never thought to do a ranch version. Everyone loved it! Husband had thirds and all children are happy. Going into my rotation for sure. Thanks! Thats awesome!! 🙂 I am so happy it was family approved at your house too! Don’t suppose you know measurement of tomatoes? Big or little can? 14.5 oz can! sorry about that! Hey! Can you explain how you came up with those container counts? Shouldn’t there be some blue in there because of the cheese? This looks delicious and can’t wait to try it. The counts just seemed different to me than what I was imagining. Ha wow! Apparently I read that and it just didn’t sink in! Thanks 🙂 It was delicious! We had it for dinner tonight. I had to drain extra liquid though because it wouldn’t soak up, and I even had added a little extra rice. Still tasty though! I read somewhere tomato sauce and salsa were purple. So I’ve always thought Cannes diced tomatoes are a purple as well? I’m going to try to modify this to make it vegetarian. I think it should work easy enough! Hi Amy! When they first published the nutrition plan, they listed tomato sauce as a purple because they meant marinara sauce which, for convenience, many people purchase it at the store in the jar and MOST marinara sauce has some added sugar. If your tomato sauce AND tomatoes have no added sugar, I measure in a green container. Hi! Making this tonight. Do we have to count one of our teaspoons for this? Perhaps I did something wrong but it was very watery… Any suggestions? so in this situation (because it happens to me also) do you just take all the liquid out before adding the uncooked rice/quinoa and chicken broth? Ok – so backing up a bit. I made this dish last week. I cooked the quinoa (rice) separately and added it to the dish. It was MUCH better this way (and a little faster too) I had pre-made that the night before so I just measured it out and added it to the skillet. I omitted the broth when I did it this way.